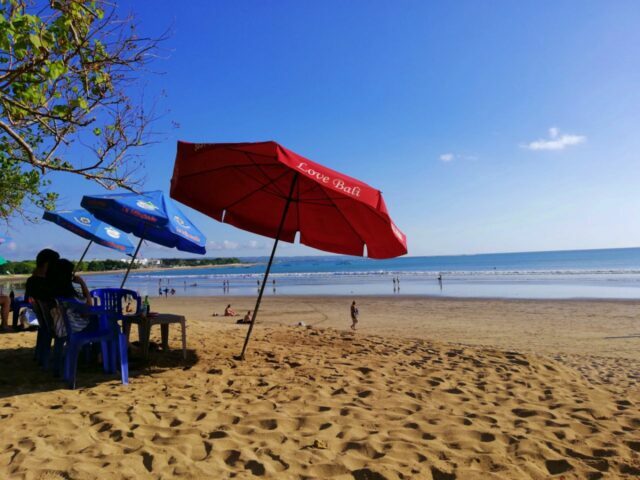 Kuta Beach is the point zero of Bali travel spot. It's where tourists, especially first-timers. Visit firstly before exploring any other places in Bali. Its shorelines stretch for miles left and right. The sunset at Kuta Beach is considered classic. 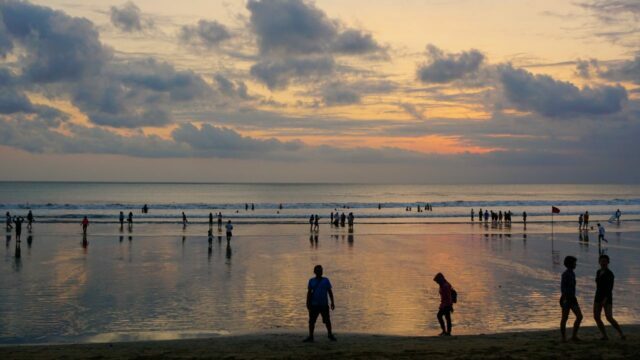 Day and night, Kuta beach is never short of visitors. 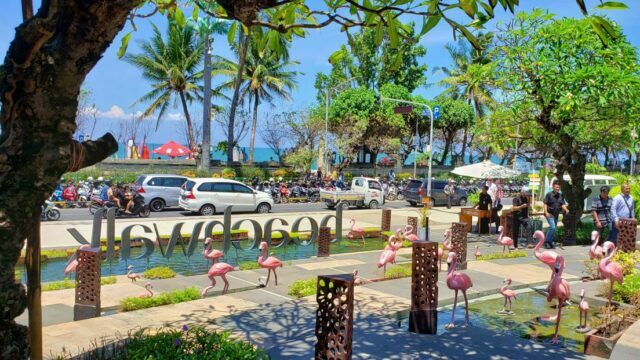 It’s hard to believe that at one point Kuta beach was a humble fishing village. Commercial tourism in Kuta starts around the 70s. A small local market from that era is now replaced with bars, nightclubs, and mega shopping malls. The village is now resorts and hotels. Kuta has sure come a long way. Many tourists develop some kind of mixed love-hate feeling when visiting Kuta Beach. Some detest the over-development, lamenting over the loss of Bali's authenticity. Or the fact that Kuta beach collects too much trash. Others fall in love for its vibrant and lively party scene. Nonetheless, Kuta Beach is still a must visit for at least once in a lifetime. Kuta is where all begin. Although at times tides at Kuta Beach can be strong. The wave here is quite accommodating for beginner and intermediate surfers. Get a surfing lesson from many of the local instructors here. Even if visitors have never touched a surfing board before. A session costs IDR 100k for an hour and a half. By the end of the course. Even a beginner will be able to at least stand on the surfboard. Rent a beach chair or lay a mat on the sand, whichever is okay. 30 minutes to an hour lounging under the Kuta sun is enough to get that ideal golden tan. Do not forget to grab a cold Bintang beer as a sunbath companion. While lying on the sun, why not try some services offered by the hawkers? For example, let a hawker braids visitors dreadlocks just with a small fee. Release that travel fatigue by having a massage from the old ladies here – they know how to do deep tissue massage. A temporary tattoo is a dream comes true for anyone wanting a cool tattoo. But without the lifetime commitment. The tattoo lasts for only two weeks. And starting from IDR 30k, it's quite cheap to get. 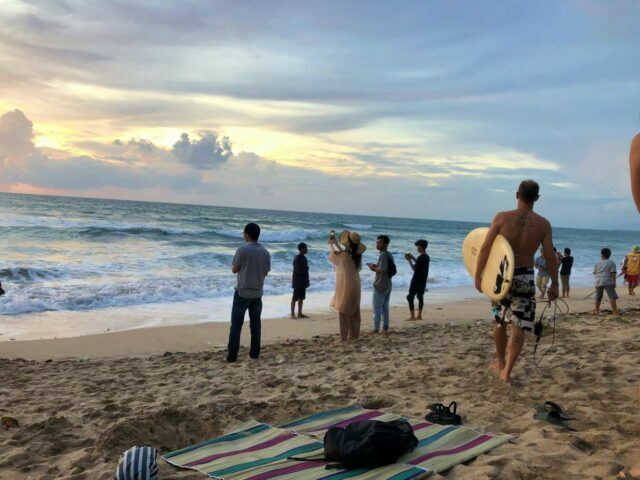 Approaching dawn, join among the eager crowd to watch the legendary sunset Kuta is famous for. When the sun is low on the horizon, its light turns the sky into a breathtaking shade of yellow, orange and black. Thanks to Kuta’s kilometers of shoreline, this display stretches uninterrupted from south to north. Once in a while, catch silhouettes of planes coming and going to the airport nearby. Bali Sea Turtle Society is located in the southern part of Kuta Beach (near Discovery Plaza). The nonprofit usually hold releasing events at 4 pm. Get a token which later exchanged into a hatchling. Then accompany this little creature making its way to the ocean. Participation is free, but visitors can also give a donation of any amount. When the sun is down the beach lightens up. Beach bars and nightclubs come into life. For a dance and party, clubs such as Sky Garden is where to spend the night. Here, dance the night out while world-class DJs tirelessly craft the best music all night long. Visitors looking for something calmer can hang at the bars by the beach. Enjoy good food while watching an acoustic music performance. Kuta is heaven for shopping. Tourists only need to cross the street to reach the shopping mall Beachwalk. While Kuta Square is only a 7 minutes walk. Enjoy the vast options of local and international brands. There are big names more than one can imagine. Along poppies lane, rows of small traditional vendors provide variations to the shiny branded stores. Prices are much cheaper here and tourists are welcome to haggle. See: Bali Tourist Attraction & Spot. 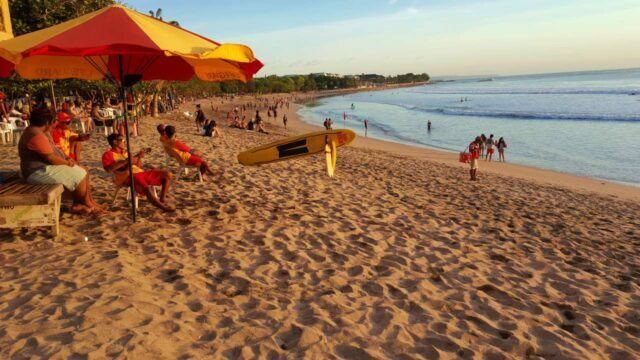 Kuta Beach is accessible for 24 hours, 7 days of the week. No entrance fee is required. Beach chairs with umbrella costs IDR 50k/half an hour to rent. Nearest parking is located along the road by the beach. Parking is IDR 20k per motorbike. See: Kecak Dance Show in Uluwatu Temple. For a tourist spot as popular as Kuta Beach, sadly there aren't many public facilities. There are toilets but visitors will need to pay when using it. Lifeguard posts are available at several spots. When it comes to accommodation, restaurants, and shopping, the choice is almost endless. Around Kuta, hotels, restaurants, and malls abound. Read: Garuda Wisnu Kencana Cultural Park, Attraction & Entrance Fee. Kuta beach is only 5 km from Ngurah Rai International Airport. From the airport, visitors can take either a taxi or a bus. The taxi is faster but expensive, costs around IDR 150k-200k per trip. Trans Sarbagita Bus is cheap, only IR 3,5k per trip, but undeniably slower. Take a Corridor 2 bus and stop at Kuta Central Parking shelter. Trans Sarbagita bus Corridor 2 also takes passengers from central Denpasar to Kuta area. Visitors can find bus stops along Ngurah Rai Bypass road. Other means of transportation is by rental motorbike, which is popular among tourists. It's cheaper and more flexible to rent a scooter (IDR 60k/day).